Katy B also made the trip up north to attend the 2013 MOBO Awards held at The Hydro in Glasgow, Scotland on Saturday evening. The dub step, R&B, funky house and UK garage singer always wears a lot of colour. This look is no exception. 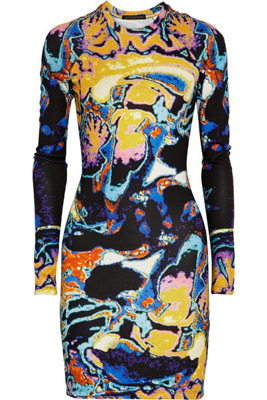 She wore a Christopher Kane coloured, print, body-con dress, which draws influence from the vivid display of an MRI brain scan. She styled it with a cheeky ‘Real Talk’ Sophia Webster clutch and black heels by the same designer. Hannah Warner rings and earrings from Rachel Boston added some subtle bling to her look. For such a vibrant dress, she perhaps didn’t need the comical clutch. What do you think? You may remember that this dress has also been worn by Jennifer Lopez and Jennifer Hudson. Net-A-Porter.com, Ssense.com, Brown Fashion, Nordstrom.